It's really hard to estimate, but I would feel confident in saying that probably at least 25% of organisms are parasites. They're often under-sampled, under-studied, and can show convergence or other forms of cryptic diversity. If you go with prokaryotes being part of "living things" - which of course, they are, then maybe the stats go down. But, out of eukaryotes, parasites have definitely got to be the majority, don't you think? Well, consider that every species of animal (I'm not even including plants here) is pretty much infested with an entire community of parasites even if you just go with the eukaryotes, and every different species has a different parasite community with various degrees of overlap, the inevitable conclusion is that free-living organisms are vastly outnumbered by parasitic ones living in or on them. This should be on a T-shirt: "There are two ways to live on this planet: Infecting or Infected"
There don't seem to be any books which are *only* about shark parasites. The marine parasitology book by Klaus Rohde cover shark parasites a little bit, but everything relating to shark parasites are found all over the place in various parasitology, marine biology, and shark biology texts. Im just trying to figure out why they choose the Greeland Sharks, and how? Do they ley eggs in there eyes? Do they just flowt into it? Unfortunately, not much is known about the life-cycle of this parasite at this point. Related species of parasites have planktonic larvae that drift through the water, so perhaps when they encounter a shark, they latch on and make their way to the eye. What does this parasite eat? I don't think this is a daft question because it would appear that the animal is neither absorbing fluids from the host nor in a position to feed on left overs from prey and carrion. It feeds by scraping the surface of the shark's eye. 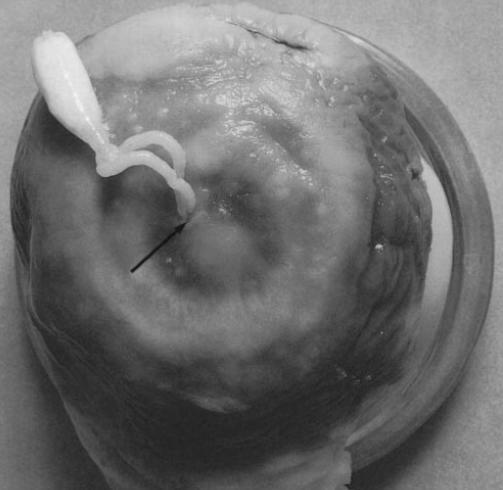 The bulb at the junction of those two "limbs" which the parasite use to attach to the shark's eye is its head. When the parasite is hungry, it simply take a nibble from the surface of the eye right in front of it. Can you remove the parasite?